This is the office dog Lily. 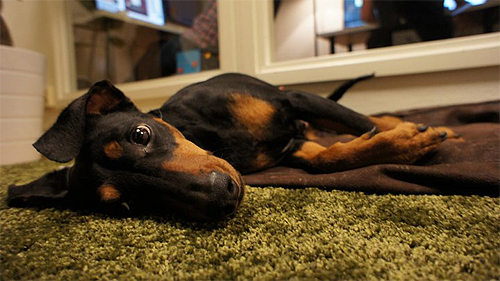 She might look innocent, but in this very picture she’s scheming her next fart attack against the Simogo HQ. And trust us, it’s lethal. Spotted in the background: Two handsome young men. Previous PostGrand Tuesday RoundupNext PostThank Godot It’s Friday! you should make a horror game about she! sooo…she’s the one responsible for the poisoned breakfast in Kosmo spin !